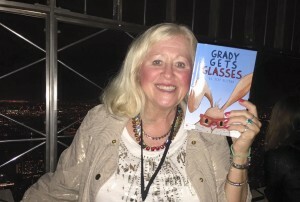 Dede Rittman, the author of GRADY GETS GLASSES, got glasses when she was just 4 years old. Her first glasses were pink, and Dede never forgot how those pretty pink glasses changed her view of the world from a large blur of fuzziness to a beautiful world of crisp colors and shapes. Dede was a high school English and Theater teacher for 37 years. She loved school, and would have taught for 40 years, but her beloved husband, Scott, was diagnosed with stage 4 colon cancer, so Dede retired in June of 2011 to care for him. Sadly, Scott died in May of 2012. Because Dede missed the classroom and helping students, she decided to write and publish her first book, STUDENT TEACHING: THE INSIDE SCOOP FROM A MASTER TEACHER. (www.dederittman.com ) Since the book’s debut in September of 2014, Dede has been enjoying numerous speaking engagements at colleges and universities, and presenting online webinars for educators, interviewing on various radio shows, and even co-hosting a radio show for education. Dede always wanted to write a children’s book, but she never wanted to write just a silly story for children. Instead, she wanted her book to help children with problems, and to help children understand a part of their world just a little bit better. So, Dede invented Grady – a rabbit with glasses. For 11 years, Dede and Scott had a pet bunny named Binky Rittman, so it was only natural that the main character in her book would be a bunny. Binky was actually a birthday gift to Dede from two of her English classes! Because Dede adored her students and always called them her “bunnies,” two of her wonderful classes bought her the best pet, Binky Rittman, so she could have a real bunny. Binky Rittman was litter-box trained and came when called. She knew words, rode in Dede’s convertible, and sometimes even slept in bed with Scott and Dede. Dede hopes that Grady becomes a friend to the reader the way her characters in her favorite books became friends to her. Dede has great hopes for GRADY GETS GLASSES to be ultra-successful! She would like to establish a GRADY GETS GLASSES FOUNDATION that would help to buy glasses for children who cannot afford them.